Appetizer meatballs made with minced jalapeño peppers deliver another level of heat when you tuck into the chipotle dipping sauce. Mix meat, cilantro, bread crumbs, jalapeño peppers, egg and 2/3 of the garlic; shape into 20 meatballs, each about 1 inch in diameter. Place on rimmed baking sheet sprayed with cooking spray. Bake 20 min. or until done (160ºF). Meanwhile, process mayo, chipotle pepper and remaining garlic in blender until smooth. Enjoy your favorite foods on occasion while keeping portion size in mind. 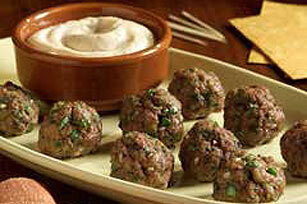 Substitute ground pork for half or all of the ground beef. For less heat, use only half of the jalapeño pepper.